A digital signature is a way of indicating that a document is authentic, has been signed by a particular person, and has not been modified since the signature was applied. Laserfiche digital signatures allow users to automatically sign and validate documents directly in the Laserfiche Client or Laserfiche Web Access. Get Document Signatures – retrieves the digital signatures on a document and information about those signatures (such as who signed it, when they signed it, why it was signed and if the signature is valid) for use as tokens in the rest of the workflow. 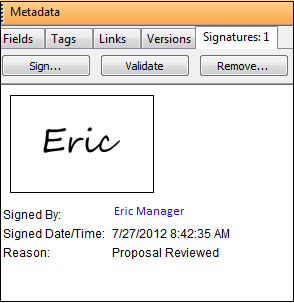 Sign Document – applies a digital signature to the document with the document signer being the Laserfiche Workflow user. Delete Document Signature – deletes the digital signatures on a document. 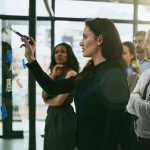 Here is how you can incorporate these activities into a basic contract management business process. The proposal to build a new playground in a city park is submitted to Parks and Recreation, where the proposal is reviewed and signed by members of the department, including the department head, if it is approved preliminarily. The proposal is then forwarded to the contracts administrator in the contracts management department for final review. The contracts administrator reviews the proposal and either approves or denies it. The proposal is signed when finalized. Denied proposals are filed away and finalized proposals get sent to the contracts clerk, who creates the actual contract. After arrival at the parks and recreation department, the proposal is scanned into Laserfiche. During scanning, the clerk manually fills out some of the template fields, such as “Company Name”, “Document Type”, “Date”, “Property” and “Contact Information”. The department head reviews the proposal and either approves or denies it by changing the value of the “Department Head Approval” field accordingly. He then digitally signs the document to signify approval. On occasion, this proposal may be sent to others within the department to review and countersign. After it is approved by Parks and Recreation, the proposal is routed to the contract department’s “Proposals – Pending Review” folder, where the “Proposal Processing” workflow is invoked. Here’s a breakdown of the workflow. This workflow can be modified to fit the needs of your individual business process. 1. The “Get Document Signatures” activity first obtains all of the signatures from the proposal and converts them into tokens. 2. A “Conditional Sequence” checks to make sure that the document has not been modified since it was signed. If the proposal was modified, the document is moved to the “Exceptions” folder and the contract clerk gets notified via e-mail. The workflow instance then terminates. 3. The proposal is moved to the “Negotiations” folder, and the contracts administrator is notified that there is a new proposal awaiting his review. 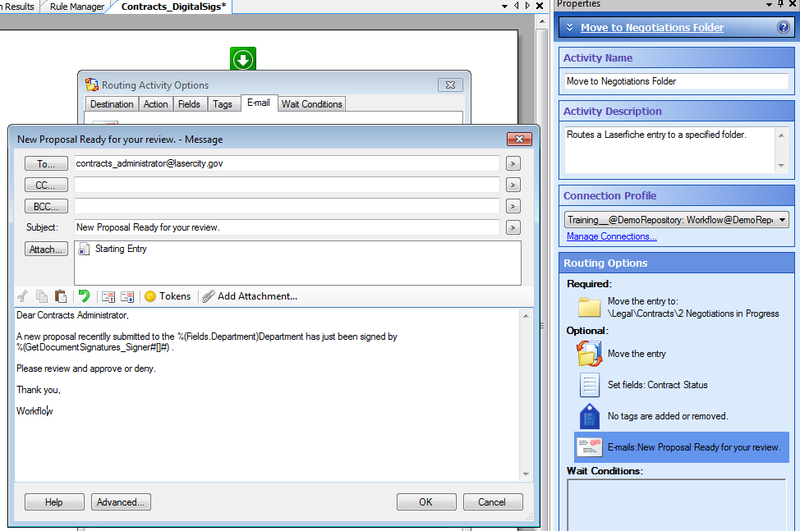 The various tokens obtained from the “Get Document Signatures” activity are used to write the e-mail. 4. Once the contracts administrator reviews the proposal, he updates the value of the “Contracts Administrator Approval” field. 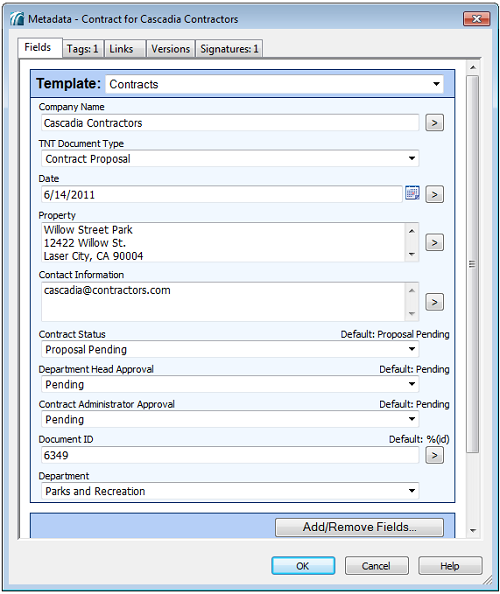 If the proposal is denied, it is moved to the “Proposals – Denied” folder, the “Contract Status” field is set to “Denied” and the Contracts Clerk is notified by e-mail. If the proposal is approved, it is sent to the “Proposals – Approved” folder and the “Contract Status” field is set to “Proposal Approved”. In order to prevent future confusion that may result from a multitude of invalid signatures, the “Delete Document Signatures” activity is used to delete all of the legacy signatures on the proposal. The proposal is then signed again with the “Sign Document” activity to signify its finalized status. A comment stating that the proposal has been finalized is added to the signature. If the contents of this proposal are modified at a later date, this final signature will become invalid. 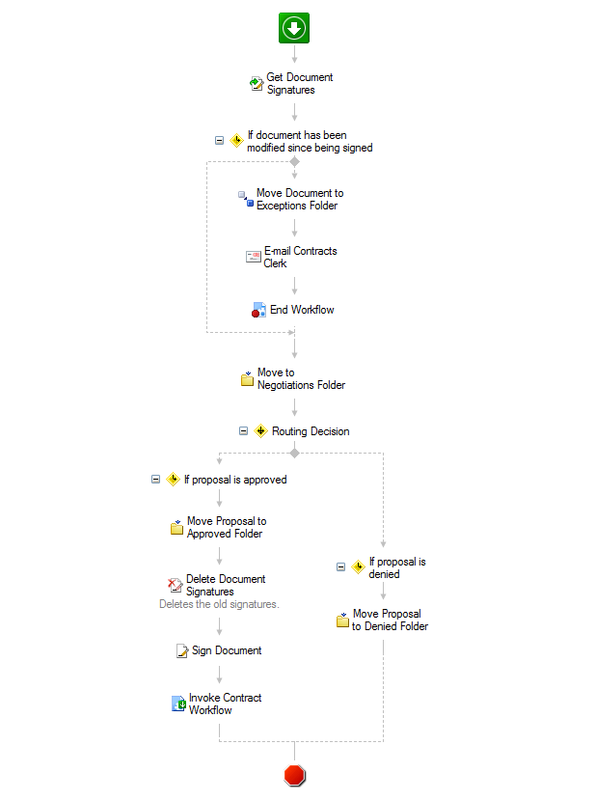 Finally, the “Contract Workflow”—which creates the contract itself—is invoked.